Ever since her first ghostly sighting, Abby Kimball has been trying to unravel the mystery of her newly discovered ability. 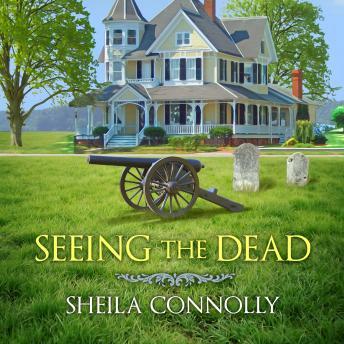 So when she sees the apparition of a Revolutionary War soldier in the middle of the town green-just days before the annual Patriot's Day celebration, no less-she's determined to figure out her connection to the man. The ethereal soldier is not the only mystery in Abby's life. She's also trying to sort out her connection to Ned Newhall, the man who shares her ability and is playing a more serious romantic role in her life every day. But with plans for the celebration ramping up and her job becoming more chaotic by the minute, Abby's finding it hard to catch her breath, much less come to grips with all the new turns her life has taken.